GOVERNMENT: Independence from the American Colonization Society, 1847. Republic with president elected by universal suffrage. Governing body: National Assembly (legislative house). 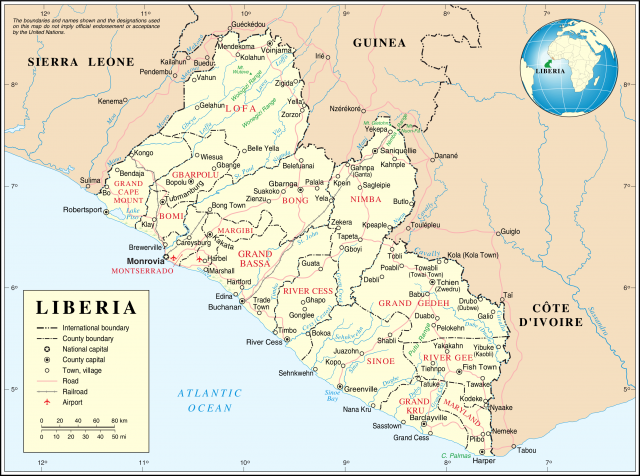 Located on the Guinea Coast of West Africa, Liberia is the oldest black republic in Africa. It was founded by free blacks from America in 1847 and maintained its independence throughout the years of European rule in Africa. At one time the country had one of the world’s fastest growing economies. However, since 1980 Liberia has been wracked by civil war and violence that have devastated the social and economic fabric of the country. The geography of Liberia has played a significant role in the country’s development. Its swampy coastline and heavily forested interior not only discouraged European settlement but also determined the farming methods used by colonists. Liberia’s location just north of the equator gives it a tropical climate marked by warm temperatures and high humidity. The country experiences distinct dry and rainy seasons each year, and annual precipitation averages 190 inches. Tropical rain forest covers nearly 60 percent of the country’s interior. At one time these forests probably extended to the Atlantic coast. However, several hundred years of human settlement have produced a savanna-like environment along the coast. The coastline itself features many narrow barrier beaches and coastal lagoons but no natural harbors. The lack of harbors is undoubtedly one reason Europeans established few trading posts in the area and later made no real effort to colonize it. Moving inland from the broad coastal plain, the elevation increases, with rolling hills, tropical forest, and eventually high plateaus and mountain ranges in the north and west. The Nimba Mountains, the highest part of Liberia, are rich in iron ore and also contain deposits of diamonds, gold, and other minerals. The nation’s current boundaries are the result of territory the American founders purchased from indigenous people. Liberia was under constant threat from surrounding French and British colonies until well into the 1900s. It now shares borders with SIERRA LEONE on the west, GUINEA on the north, and IVORY COAST on the east and northeast. Liberia’s economy has traditionally been based on agriculture, primarily subsistence farming. Dry upland rice, the most important staple crop, is planted in fields created by clearing forests. In dry rice farming the fields are left fallow for 7 to 12 years between crops to allow the soil to become fertile again. The system makes it difficult for the country to produce enough food for its population, and Liberia depends heavily on imported food. Cassava, eggplant, corn, okra, and peppers are often planted along with the rice. Many Liberian farmers also grow crops such as citrus fruits, bananas, and sugarcane. The economy of the country has also depended heavily on exports of raw materials, particular rubber and iron ore. In many cases the Liberian government sold the rights to exploit these products to foreign companies. Liberians received little benefit from their country’s leading exports because foreign firms controlled them. In any event, after civil war broke out in Liberia, rubber and iron exports plummeted. Development of other areas of the economy, such as manufacturing and commerce, has been held back by the country’s poor infrastructure. In addition, the civil war destroyed many of the country’s roads, railroads, and industrial facilities. Future economic development will require massive amounts of foreign aid and a climate of stability that will attract foreign investment. Many historical accounts claim that Liberia was founded by freed American slaves. However, like many statements about Liberian history, this is an oversimplification of some complicated events. The original inhabitants of Liberia were Mel-speaking peoples who were joined by Mande speakers from the northern forests and savannas in the 1400s. Long before the arrival of Europeans on the Atlantic coast, these groups were involved in trade across the SAHARA DESERT in pepper, gold, ivory, and other products. When European traders appeared in the 1500s, trading activity moved toward the coast. Mande and Mel chiefdoms provided slaves for the Atlantic trade, while Kru-speaking peoples of southeastern Liberia served as dockworkers, deck hands, and laborers. U.S. involvement in Liberia grew out of the efforts of the American Colonization Society (ACS), a group of wealthy white Americans who worked to resettle free blacks in Africa. This group sought to remove free blacks from America because their presence served as a challenge to the moral and legal basis of SLAVERY. Formed in 1816, the ACS brought the first black American immigrants to Liberia in 1822. Many of them were educated business and professional people who felt a sense of superiority to both the local population and to the freed American field slaves who came to Liberia later. In 1847 the educated black immigrants declared independence from the ACS and founded Liberia as a republic modeled after the United States. These settlers were determined to end the SLAVE TRADE and take over the dominant position in the coastal economy. Using a combination of military force, treaties, trade agreements, and political marriages into prominent local families, they managed to extend their control over the region. These Americo-Liberians controlled power in Liberia and discriminated against indigenous peoples in education, business, and civil service. However, because the local population was not racially distinct from the newcomers, some indigenous peoples were able to gain access to positions of influence. This contrasted sharply with European colonies in which skin color presented a steep barrier between the rulers and the ruled. Perhaps the most important political figure in Liberian history, William TUBMAN served as the nation’s president from 1944 to 1971. His election ushered in a new era in Liberian politics because he did not belong to one of the prominent families that dominated the capital city of Monrovia. Although a loyal member of the True Whig Party, which had controlled Liberian politics since 1877, Tubman tried to reach out to indigenous peoples. He launched what he called the Open Door Policy to provide economic opportunities for all Liberians by making the country more attractive to foreign investors. He also gave indigenous people the right to vote and lowered property qualifications for voting. At the same time, though, Tubman introduced programs designed to continue minority rule while creating the illusion of sharing power with the African majority. Under Tubman, Liberia continued to be a one-party state, but Western leaders found his policies attractive. Liberia was the first nation in Africa to earn a seat in the United Nations Security Council. President John F. Kennedy made Liberia a focus of the Peace Corps, whose members helped build many schools and hospitals in the country. Tubman wanted to be a leader of the newly independent African states, and his politics had a great deal of influence on the ORGANIZATION OF AFRICAN UNITY. When Tubman died in 1971, his vice president, William Tolbert, succeeded him. The new president claimed to be interested in listening to and meeting the needs of the indigenous population, but he continued most of the policies established under Tubman. By the mid-1970s, Liberia’s government faced a number of political and economic challenges. Tensions came to a head in April 1979, when police and army forces fired into a crowd of unarmed protesters, killing an unknown number of people. A year later, Tolbert was overthrown in a military coup and assassinated. The leader of the coup, Samuel Doe, formed a military government and promised to hold elections in five years. During that time he appointed members of his own ethnic group, the Krahn, to many government and army posts. This marked the first time that ethnic identity was introduced as a factor in Liberian politics. When elections were held in 1985, Doe claimed victory even though he actually lost by a wide margin. An army general attempted a coup a month after the election, but Doe survived and retaliated brutally against members of the Dan, the general’s ethnic group. In December 1989, Charles Taylor, a former member of Doe’s government, led a small force into Liberia from Ivory Coast. The local people supported the invaders and civil war erupted. In 1990 an international military force led by NIGERIA intervened in Liberia and prevented Taylor from taking Monrovia. In the meantime a rival group had captured and killed Doe. A regional alliance, the Economic Community of West African States, then set up a civilian government led by Amos Sawyer, another former Doe supporter. Sawyer and his forces controlled the towns, but Taylor held the countryside. The civil war ended with a cease-fire in 1997, and later that year Taylor was elected president. He has run Liberia like a warlord, with his security forces arresting and executing opponents of his regime. Taylor has also plundered Liberia’s resources for his personal gain and helped destabilize the area by supporting rebels fighting the government of neighboring Sierra Leone. By the year 2001, the Liberian economy continued to deteriorate, and a return to peace, democracy, and stability appeared a dim hope. Liberia’s people are divided into three major language groups: the Mande, Mel, and Kruan. The largest of these is the Mande, who mainly inhabit the north and west along with the Mel. The Kru-speakers live mainly in the southeast. Many Liberians share ethnic identity with people living in the neighboring countries of Guinea, Sierra Leone, and Ivory Coast. The Mande and Mel have hierarchical societies in which individuals trace ancestry through the male line. Both societies are also characterized by the existence of SECRET SOCIETIES. The Kruan peoples are less hierarchical, and secret societies do not exist among them.